Easy Does It. And, Why Patient is Better. OK, so yesterday I posted a “how to draw a bird ‘lesson’ “, which I believe is probably the “correct” way to approach a bird drawing. I just have a little confession to make. Most of the time I’m too impatient, and so I just dive right in and forget about sketching in the basic shapes first. If I’m in the zone, it might work out (for the most part), but if I’m tired/cranky (which is pretty much the same as being out of the zone), or if the art gods have gone off on vacation that day, then it won’t. And so I’d have to scrap it or do a lot of erasing…and if I was working with a very dark colored pencil or ink, I wouldn’t really be able to erase. 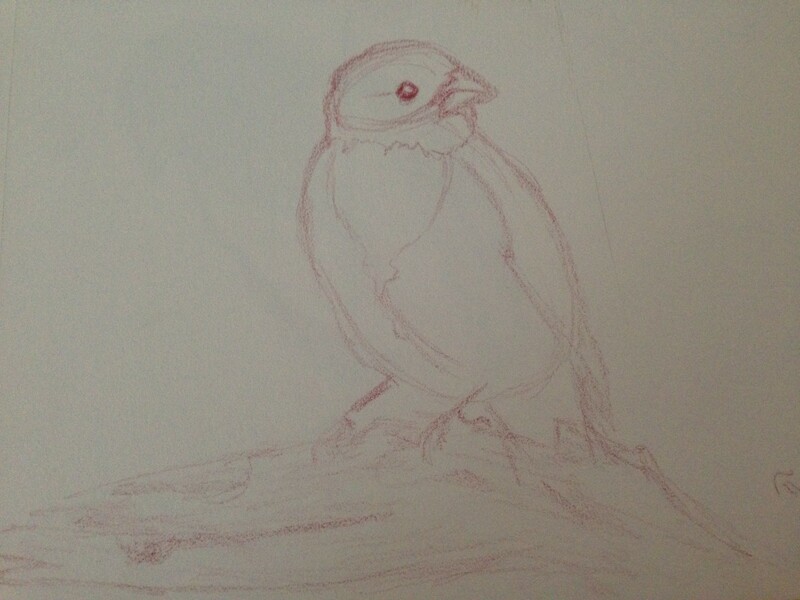 So, case in point: here are my very first sketches of Kathy’s terrific rose-breasted grosbeak photos. Here is the first one. We’ll call it the impatient one. Part of the challenge for me with these guys is I have yet to see one in real life. Hub has seen them (they’re on our “rarely seen” list), but I never have. Which makes trying to capture him on paper a bit harder, I think. Anyway, I shall press on, but I thought this might help or interest someone out there. Kathy, if you’re reading this, I’ve drawn six of those birds in your grosbeak post so far! I am soooo enjoying your images. And I just wanna say that all over again to all of my photographer friends out there: your work really makes life easier for “artists” like me who are NON-photographers. I find the success of the final piece of artwork is directly proportional to the crispness of the photo. I guess that goes without saying, but some of the portraits I’ve tried never even made it here because the photos were taken long before all of the newfangled gadgets came out that allow better-than-real-life viewing. I’m amazed by what technology can do. Happy beautiful spring Tuesday to you! Go in peace, not in pieces (thanks, D). I always enjoy reading about your process. I like both drawings! 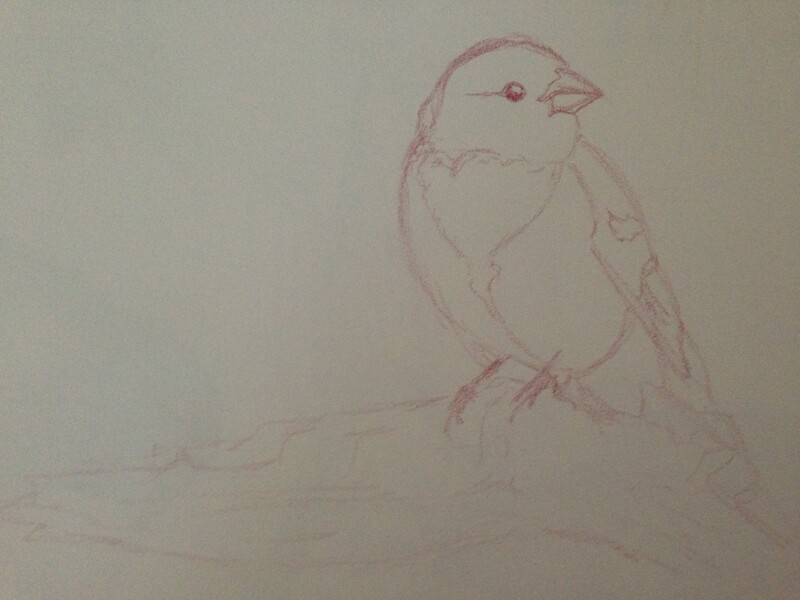 I don’t know much about birds and perspective/proportions are not my strong point, but I like the first bird a lot (the impatient one) there’s something really cute about him being all puffed up. Oh, I hope you do. Seriously, I do numbers all day. I’m not right-brained. If I can do this, anyone can. Give it a try, don’t expect perfection for awhile (or ever, really), but if you love birds as you seem to, you won’t ever regret it. Great tips for drawing lifelike birds, thanks! You’re welcome. I don’t know much, just tossing in my two cents. Enjoy! Great tips today – seems we were both in a tips post mood 🙂 – The birds really do look so different with such subtle changes to size and shape! GOOD STUFF! Thanks, Jodi! The video is really great, if you’re interested in drawing birds. He basically summarizes his book in like 12 minutes! will definitely find time to check it out! Thank you very much. I do love them, and maybe that translates. Oh, I don’t know…I think the first one is pretty darling. It’s amazing how the same bird can look very different depending on its pose. I know my Rose-breasted Grosbeaks pretty well and I think both pictures are lovely! I could be wrong, and I do think the part of the circle that I didn’t erase below the eye makes the second one less appealing, but I feel like proportionately, the second one is closer. I never actually did what you’re “supposed” to do, which is to measure the head and see how many heads should fit inside the body. I should probably do this, so I know for sure, as the goal is to improve lol! Thanks for your comments, as always. I’m glad you like the drawings. You’re right that proportionally, the second one is closer, but I don’t think the circle under the eye makes it less nice. 🙂 Also, once you apply color, you won’t be able to see that circle, right? I use rough measurements when I draw realistic things (using the pencil or my fingers as a ruler), but I’m generally concerned only when doing portraits. And even then, I use more of a gestalt feel than measuring. You are getting really good really fast and I can see you going by feel one day and relying less on strict measurement! Your compliments are making my morning, lol! This was just a sketch, so I wasn’t looking to paint over top of it, but I see what you mean. Yeah, it really wouldn’t make a difference if I was going to paint it. I like your rough measurements using fingers idea. I am way too impatient when I’m in the zone to even go find a ruler half the time. For portraits, yeah, I do use more measurements if I really want the likeness to be close to “true”. I can sketch someone, and most of my portraits were done this way, without measurements, but only a couple of them in my opinion look “true” and those are the ones I did using measurements (Whoopi, Keith Urban (2nd time around), Harry Potter actor guy (sorry his name escapes me – and his actually doesn’t even look that true because his lips threw me way off). I don’t know what it is with me and art, but it won’t let me go. I don’t seem to have much choice in it, for now. If I want to really be happy and at peace, I need to make artwork of some kind. Not sure if this will ever change! Have you experienced the same thing? I feel like I’m not the only one, but it is really a turnaround for me, something I’ve not experienced before (and I’m 46). I feel like I’ve heard of Val Webb, I’ll have to check that class out! I’ve been watching Cathy Johnson’s YouTube’s and Jack Muir’s recently too, now that I know he has a bunch of them. I agree though, Jill, it really is in the doing. I’m just trying to leave a few breadcrumbs for people who might want to join in on Friday, who really feel that they can’t draw. I think it’s a shame, so many people say they don’t have the “gift” and I know that’s junk, because I told myself that all my life, and it’s only because I have a brother & a sister who really ARE gifted and probably were born with pencils in their hands. So, since I wasn’t like them, I decided it wasn’t worth trying. I’m really hoping this draw a bird thing on the 8th of the month will start to show people that you don’t have to be born with some magical “gift”. Art is too great and I know it’s changed my life totally, so … just trying to share some info and set some people free. I still don’t think I’m all the way out of the cage, but hopefully at some point lol! You are a funny lady lol. I’d actually like to do this and have thought about it, oddly lol. But I don’t think it ever happens, however I thank you for flinging all that joy out into the universe on my behalf. *kicks Ann’s guests to the curb with their luggage* lol. You’re great for my ego, lady!! LOL 😄 Please don´t forget this tutorial thing, I think it´s a great idea! You´re a really motivating person for a lot of people here, I think! Aww thank you Ann. I appreciate it.